Though I don't remember much about music or movies in the 80's, I remember the great political debates. 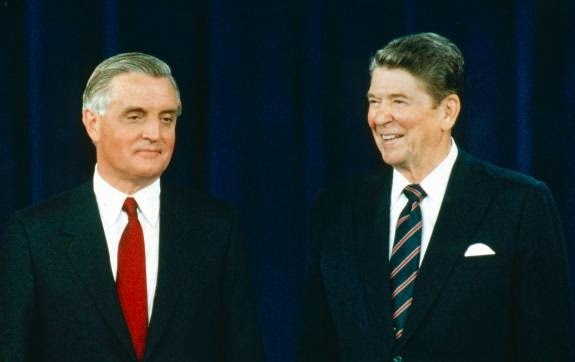 Ronald Reagan, Walter Mondale, Ollie North, Robert Bork all loom large in my memory. And abortion. All things considered Roe was still recent history. 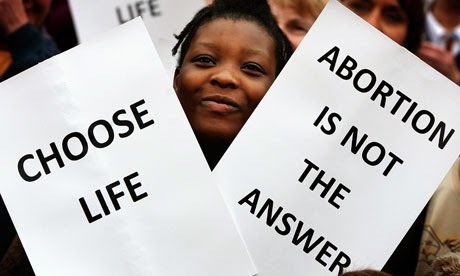 I made signs on poster board and marched in the annual pro-life rally every January. I watched the videos. I listened to the radio interviews. What is paramount in my memory was being told that women were being lied to about what was really growing inside them. "'They're' not telling them it's a baby. 'They're' telling women it's a blob of tissue. They don't know they're killing their unborn child." Women were more victim than perpetrator. I don't have any reason to believe this isn't true, though reports may have been exaggerated for effect. That's unpleasant enough, but it's worse that in 2014 most women know exactly what they're doing and they're still doing it. This is why waving around graphic photos of aborted babies doesn't work. If you don't believe me, take a deep breath and read My Year as An Abortion Doula on Slate. I have, by this point, seen lots of women and lots of fetuses, and the sight of the second doesn't change my feelings about the first. This clever manipulation of our language by which we reject the simple and obvious word baby for the less emotionally-charged fetus (it's cliche, but I can't help but think of George Orwell's prophetic linguistic invention, doublespeak) has made abortion appear straightforward and sterile in a way that Margaret Sanger never dreamed. This woman, certified as a doula to support women during the painful process of child birth (read my own experience here), is using her skills to help women end the life she's been trained to help ease out naturally. This is a difficult juxtaposition for me to accept, but I'll let that go. Instead I focus on her indifference to what she is witnessing. Oh yes, she admits it's difficult, especially at the beginning, and the enlightened commentators following her column praise her straightforward, honest depiction of a "complicated" issue. But her unswerving belief that what she's doing is for the Greater Good even as she witnesses the transfer of a dead, doll-size human into a bucket is disturbing. Let's re-imagine the last sentence quoted above. "I have, by this point, seen lots of women and lots of their babies dead by their own hands and the sight of their lifeless bodies doesn't change my feelings about a woman's desire to live the way she wants." I'm being brutal. I can't help it. This is an article on a popular online magazine in the most developed country the world has ever seen. And we're casually writing and reading about a the experiences of one woman helping another woman kill her unborn child and watching it get shoved into a bucket, fully intact. The more you read it, the harder it is to believe it. I was in school abroad....grew up in DOD schools and they had a bit more liberty to teach the truth. Sexual education included very vivid information. We learned EVERYTHING about reproduction...as I said vividly. We saw a live birth with all it's loveliness and reality. We were also shown in technicolor the various abortion "choices" available. I will never forget those images seared on my mind and because god has not made me as cold as the quoted sentence that chilled you, I remember the incredulity and the horror and the overall wrongness of it. That sexual education class made me a believer in LIFE and that no choice has the right to end it. It confirms, when I reflect on it, that even then God was showing me grace and keeping me from wrongful paths prior to Him giving me a heart of flesh. Shalom from the south.